Good food, healthy eating and wellbeing at work are all themes being embraced by Plymouth University as part of National Dietitians Week. From 6-10 June, the University’s dietetics staff will be raising awareness of the profession and highlighting how eating well and regularly can help to improve health and happiness. 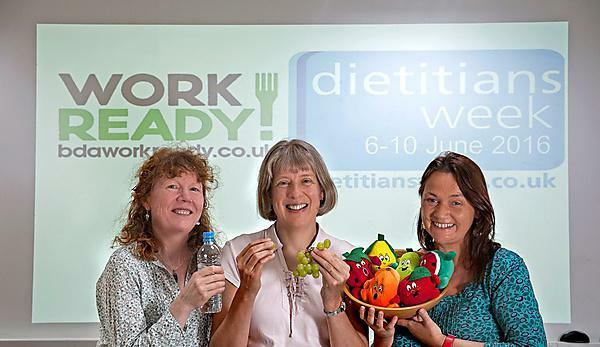 Organised by the British Dietetics Association (BDA), Dietitians Week is now in its third year and takes on the theme of ‘workplace health’ for 2016. Each day of the week has a different theme related to food in the workplace and, to coincide with Wednesday’s topic of ‘protecting your lunch break’, the University’s campus cafés are offering a 20 per cent discount on food for staff on 8 June. Other daily themes are food and mood, which aims to combat the negative effects of hunger; hydration, which raises awareness of drinking enough fluids; and movement, establishing whether people have enough chances to be active in their working day. The University, in conjunction with the BDA, is asking the public to take part in the week by tweeting pictures of their food to @DietitiansWeek and @plymuni with the hashtag #DietitiansWeek. For more information about the week’s events visit https://www.plymouth.ac.uk/whats-on/national-dietitians-week. Designed for registered dieticians, this pathway has a specialist core module in nutritional support in illness-related malnutrition, which focuses on current evidence for oral, enteral and parenteral intervention in a range of clinical conditions. Are you interested in studying dietetics? A lot of people think dietitians just advise and support people with weight problems. That's a relatively small part of what they do. Academic lead, Dr Avril Collinson talks you through the key features of our BSc (Hons) Dietetics course. Watch the video to find out more about learning, placements and careers and see what's it's like to study at Plymouth.